At the dawn of the Jurassic Period – a small group of dinosaurs was rapidly buried by a sand dune that collapsed on edge of a seasonal river channel. These 200 million year old Jurassic dinosaur skeletons are found today on the northern shore of the Bay of Fundy, near Parrsboro, Nova Scotia. These are the oldest dinosaur bones in Canada. 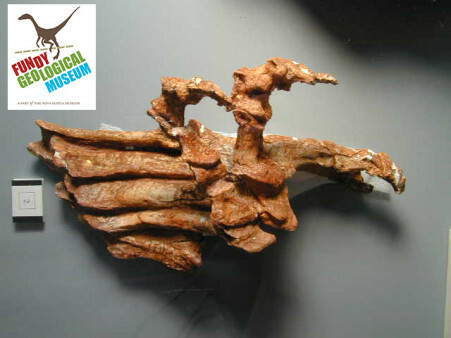 The first articulated skeleton found in Nova Scotia is a small ‘prosauropod’ dinosaur, specimen FGM994G69. In the summer of 1992, during the field trip during a conference of professional geologists (GAC), Bob Grantham, then Curator of Geology of the Nova Scotia Museum, discovered fragments of the dinosaur skeleton low in the sandstone cliff. Over the next two years, the Curator at the Fundy Geological Museum (K. Adams) worked with George Hrynewich (citizen scientist) to collect the important specimen. Subsequent study of GF69 has supported by a Nova Scotia Museum Research Grant (1997) and research grants from the Canadian Geographic Society (1998) and the Jurassic Foundation. Dinosaur skeleton GF69 is special because the bones remain articulated together and the dinosaur is nearly complete. The skeleton is missing the skull and left front leg but is otherwise preserved. Like all dinosaurs from this research site, the bones of the skeleton have been sliced and shifted due to ancient earthquakes that occurred as the supercontinent Pangea was breaking apart. These geological “faults” shifted the bones as the earth trembled 200 million years ago. However, one of the unique features of GF69 are the dislocated toes preserved in the skeleton. The toes were bent backward and crushed under the weight of the dinosaur’s body. These dislocated toes of the dinosaur have been preserved in the sandstone for 200 million years. Using the digital Plateosaurus 3D model (Credit: Heinrich Mallison), an analysis began in 2014, to examine the rotational orientation of the right rear leg of the dinosaur to result in a burial pose as preserved in specimen GF69. The video shows how the right rear foot becomes oriented under the weight of the body through a series of rotations of the femur, tibia, ankle, and phalanx bones of the toes. The femur bends upward and the tibia flexes as the toes become bent backward and dislocated due to the weight of the body. – TJ Fedak, 2015. Mallison, H. 2010. The digital Plateosaurus II: An assessment of the range of motion of the limbs and vertebral column and of previous reconstructions using a digital skeletal mount. Using data provided by the 3D model further research will show how the skeleton was then distorted due to geological faults that affect the entire shore line of the Bay of Fundy. Feel free to leave a comment or question below.